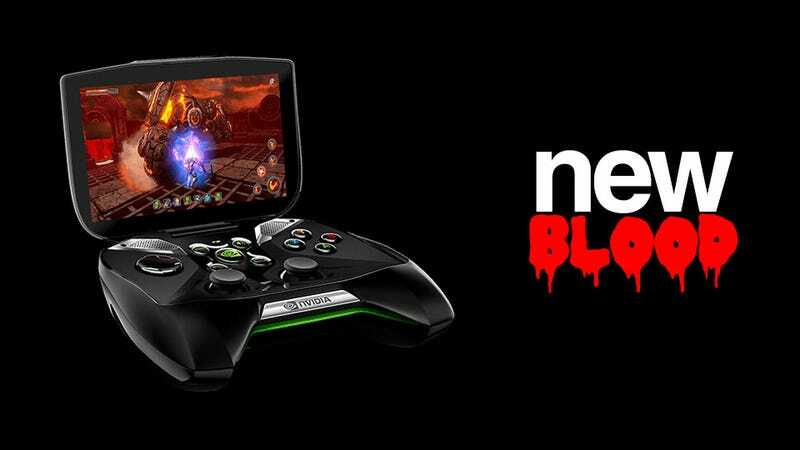 Nvidia just surprised a whole bunch of people by announcing, of all things, a dedicated gaming handheld during the company's CES press conference. Based on the new Tegra 4 mobile chip, also announced at the show, it's code-named Nvidia Shield. There are 5-10 hours of battery life, and it's based on a clamshell design, sort of like a DS (only without the bottom screen). Running on Android (they say "pure Android", so hopefully no Nvidia skin), it's got a MicroSD slot, micro USB and HDMI output (which supports 4K output so long as your display does). The Shield's 5" screen is a touchscreen, and is capable of 720p display at 294dpi (they're calling it a "retinal display"). A small shield on the back of the top screen is removable and customisable. Below you'll see a size comparison, facing the Shield off against an Xbox 360 pad and a Wii U Controller. Nvidia say the Shield has "console-grade controls", which sounds like they're actually using the same kind of thumbsticks and buttons you get on proper controllers, not the smaller/lesser kind you get on portable platforms. Here's the Shield's media library UI, which can be augmented by the fact it can access the Android versions of apps like Netflix and Hulu. In addition to running its own Android games, the Shield can also stream games from your PC to the controller, where you can either play them direct on the small screen or, more practically, output to your TV. A demonstration showing Need For Speed: Most Wanted and Assassin's Creed III being beamed from a PC to the controller was impressive, to say the least. Because Steam now has its Big Picture mode, the Shield can be used to navigate the store without having to move back to your PC. Sadly, there was no price or release information provided.